One of the things I missed on Linux was a quality .chm file viewer. I installed xCHM about year (or more) ago. I was good, but missed important features like copy/paste and Index. Well, I just tried version 1.4, and I’m delighted. Today I learned that there is also GnoCHM, but it requires Gnome which I don’t have installed on my Slackware, and it seems like overkill to install entire Gnome for this. Plus, many people have problems with available Gnome packages for Slackware, so I decided to forget about - especially after I tried new xCHM. It really rocks. Some people might argue that it requires wxWidgets, but that’s not even a slight problem for me, as I develop wxWidgets based applications myself, so I already have it installed (in 5-6 different versions and configurations). If you tried xCHM before and didn’t like it - give it another shot. There is no better way to read PHP manual (at least: known to me). 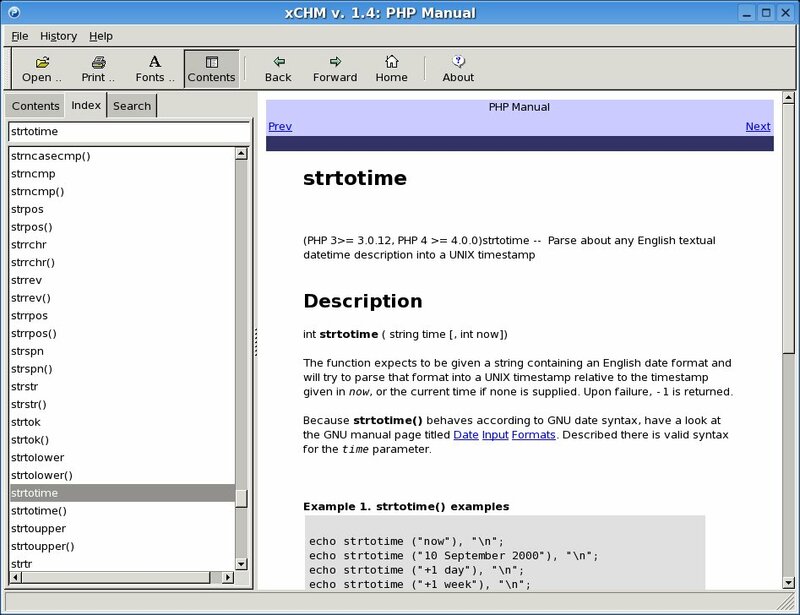 CHM is superior to plain HTML documentation because it provides you with Index and Search features - and grep just isn’t that user friendly for this.